Inspect Your Stored RV To Avoid "Surprises!" 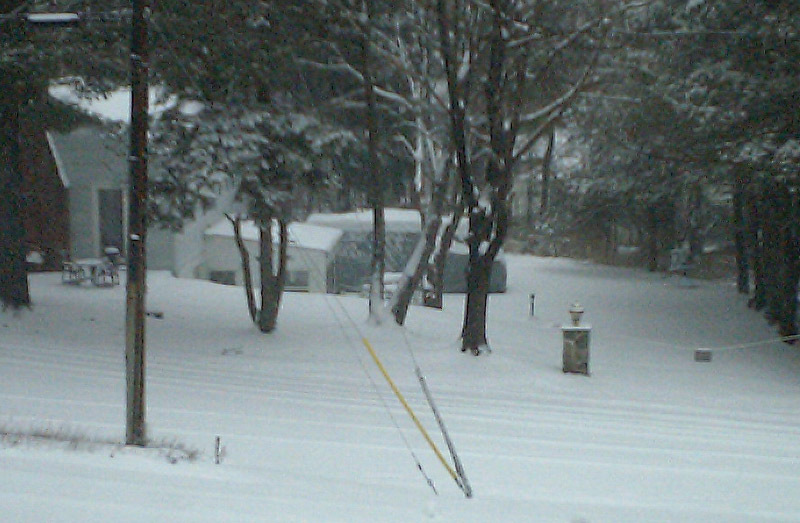 Right now, my RV is shivering under a cover out in the wilds of my driveway. I've winterized it, removed any food that could be harmed by the cold, shut down the fridge, closed the LP gas valve and left it plugged in to shore power to maintain the batteries. I'd use my solar panels, but they don't work very well (at all!) while under a cover. In order to avoid unpleasant surprises when I get the rig ready for the next season, I periodically zip the cover open and go inside to look around. You could find all sorts of unpleasantness or nothing at all. It's truly worth the peace of mind to check a few times. I find once a month works well...or after any particularly bad weather. What should you look for? Read on! First thing I check is how the batteries are. If you have a motorized step, is it opening at its normal speed? If it's very slow...or not moving at all...if it's not frozen or rusted/corroded, the likely culprit is the batteries (especially if you didn't have a maintenance charger or shore power plugged in.) If you have a battery disconnect switch, turn it on. Did your coach turn on normally? If so...great! If not...well, check the batteries for voltage. Should be more than 12 Volts...If it's on a multistage charger, then they should be happily kept at around 13.x Volts. Next, I check around for water intrusion. Especially the roof. Run your hand around all vents, the A/C unit, any skylights you have, your windows and the exhausts/chimneys for various appliances and your stove vent fan. Often these are in the cabinets. Open them! Feel the roof INSIDE the cabinets too. If it's damp, try and find out why. Leaving things damp all storage season will do more damage. While you're looking through your cabinets, check for critter nests and the like. Amazing where they can get into! Under the couch, behind tables...anyplace you can get to is worth a look. Bring a flashlight! Check your fridge for mold/mildew. Even a well-cleaned open fridge can develop some. Believe me...I HATE cleaning that nastiness!! It pays to look now, when a simple spritz with cleaner and wipe will fix the problem! A problem avoided is a good thing! I also take this time to check the water in my batteries. Since I leave them on a 4-stage maintenance charger, I like to make sure they have the proper amount of water and/or the charger is functioning properly (not boiling them to death). Batteries are expensive -- If maintained properly they will last for many years. I also lift up the edges of the cover to check underneath. Not for anything specific, but just general condition. Especially up by the engine bay. Is there anything leaking? Puddles under the Engine or Transmission could be a bad sign. Catch that sort of thing early and you're in better shape. This may sound a bit crazy, but when I'm done I just sit on the couch for a while and look around. I mean, I miss my RV and traveling. Think of it as a visit. You can talk to it if you wish. That's OK...unless it answers back. Then seek professional help. Really. And HAPPY NEW YEAR! Santa Was Very Good To Me This Year! - New Gizmo! Lots of clothing. Lounging around wear (perfect for the RV!) Sweaters, jeans, shirts, shorts. I almost have enough to build a brand new wardrobe. Like most guys, I rarely buy clothes. Preferring to wear the old ones into the ground before replacing them. They're COMFORTABLE! Now, that doesn't mean I don't have business wear as well, but they don't get used as much. Who doesn't have a perfectly worn in pair of jeans that's become a favorite??? Then there's this thing. Most of you know, I like making fast food style Ham, egg and cheese sandwiches (on English Muffins, of course!) Heck, I even wrote an article on how to do it on an RV trip. Now I have an appliance that does it exclusively! I gotta tell you, it looks cool. Not sure if it will work as well as it claims too. I had a microwave one that claimed to make perfect Ham, egg and cheese...not so much. It was a real pain to use and even more of a pain to clean up. (It received one of my rare bad product reviews!) This one looks far better thought out. The idea is you build the sandwich from the bottom up. Into the first movable ring (that sits on the base) you place the bottom of the English muffin, then the cheese, then any meat (I like ham) you'd like. Pull down the next ring and crack an egg or pour in some egg-beaters or egg substitute This ring has a sliding bottom that is designed to slide out of the way and deposit the cooked egg on the bottom layers. Finally place the top of the muffin on the egg and pull down the top. It just rests there and will (supposedly) rise as the egg cooks. They say five minutes and it's done. We'll see how it works. I have NEVER seen this gizmo before. It fascinates me. Then again, most mechanical things do! **OK. It's now Christmas Morning and I have had a full test run on the cooker. It works. Sort of. The one I have has a malfunctioning "ready" light, so it is unclear how much time it really takes to preheat. Cooking indeed takes 5 minutes. It uses around 550 Watts at 120V of power, so figure around 4.6 Amps at 120v or around 50 Amps at 12V (figuring the Inverter is around 87% efficient) With around 10 minutes or so of total use time that works out to 1/6th of 50 Amps which is around 8.5 Amp/hours out of your battery bank. Doable....but since it's morning, your batteries will be at their lowest of the day (especially if you have used your furnace all night.) These numbers are "back of the napkin" calculations, so don't look for absolute accuracy here. rather a guideline for power consumption. While this thing works, I'll stick with my original recipe using the microwave egg cooker....less stuff to store and carry on trips. To all, Merry Christmas and Happy Holidays!! I have a feeling Santa will be back tomorrow. That's when I usually get all the chocolate and snacks delivered. Since I am dieting (and losing weight) he's a bit of a bad fellow for tempting me! Happy Holidays! - Yes, I Know It's A Bit Early! We're all gearing up here for a Merry Christmas, Happy Hanukkah and even a Joyous Kwanzaa. I just wanted to let everyone know my wishes extend to my entire extended RV family. Writing these articles each week, has been one of the truly enjoyable things I get to do. Many of you have expressed thanks for the information contained in them. For that, I thank you heartily. 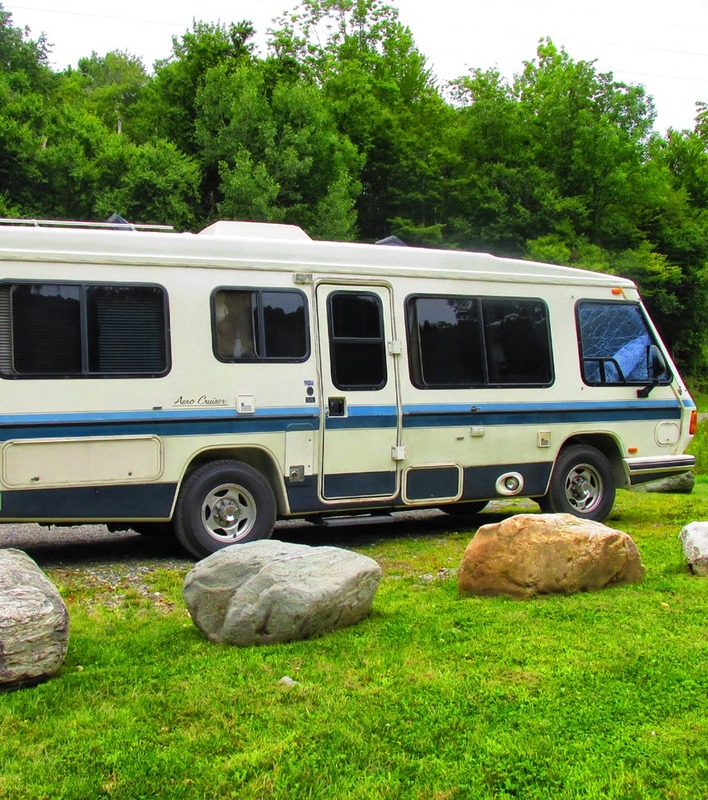 Being in the Northeastern US and being an avid RV'er can be pretty tough around the holidays. You get to see your RV under cover and snow on the ground. Quite a bummer. I get to plan for next season...that's OK. But the desire to travel, to be on the road is very strong. OK, enough whining! 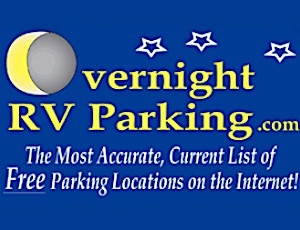 In the coming year...I'm really going to make a concerted effort to get out and meet more RV'ers. I'll bet there are quite a few of us here in the Northeast. All of us wishing we could be on the road again...sooner. Hmmm....maybe, after I find some of these folks, we could all get together over the winter and plan for the next season. Sharing ideas, having fun and generally goofing around isn't out of the question! Once in a while I see some posts on RV forums from folks who are in the Northeast. Sometimes I respond either publicly or privately...usually, no response. Maybe this article will spur some of them to "come out of the woodwork!" In other news, I've found all the fans I need to update both the bathroom 6" circular one and the one in the range hood. Stay tuned, if I can find an easy way to heat the inside of my covered RV, I will at least make an attempt to get some projects done! I know...use an electric heater....OK I'll see if my Electric Fireplace will heat up the whole RV...it will be a great experiment. With the cover on and all the windows blocked with my mylar/bubble covers...it's pretty dark and cozy in there. Add the fireplace and it could be a romantic place. Hmmmm any ideas who I should share that with? Merry Christmas! 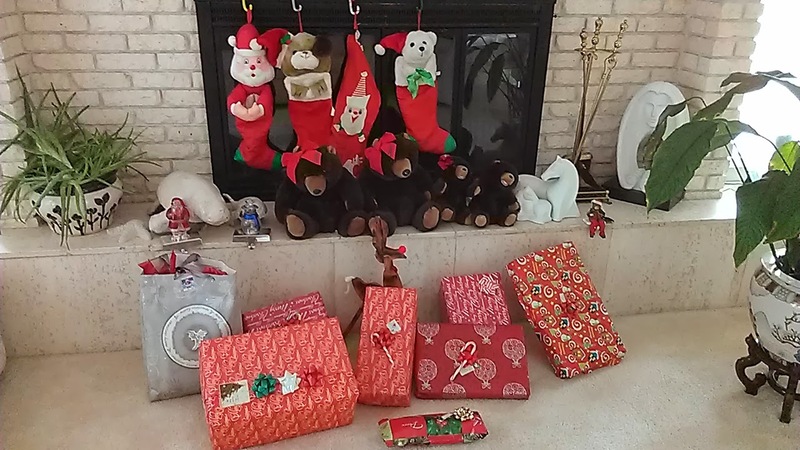 Hope Santa and the Elves bring you lots of great RV stuff! Ugh. It's Officially NOT RV Season In The NorthEast. It's Planning Time! How Depressing. We just had our first big snowstorm in New York, 6-8 inches where my RV is parked. You know it's depressing to look at your RV, under a cover (or Not!) covered in snow and ice. Ho Hum. Even with the Christmas holiday rapidly approaching, I wish I could be out on the road taking one of my "snap" trips to anyplace. A quick getaway to chase the blues away. OK...enough whining. The one thing I CAN do in the dreary off season is plan! New modifications, improvements and trips for next season. After all it's only about 4 months away. I've got a list of modifications that have been pending for a while. Some because the technology simply isn't available yet. (eg., Lithium Batteries) and some because they drifted father down the list because of repairs that took precedence. Now they're back! These are just a few examples. If, at any time, you have some suggestions for modifications, improvements, even products to try out, do not hesitate to comment! Trip planning is another yearly winter project. I have several different types of trips I can go on during our RV season. There's the "Bounce Trip," that's the one where I can sneak away on a Friday evening and return on a Sunday evening. I try and arrive at the destination on Friday late and have at least 2 full nights parked. Then travel back on Sunday mid-morning. Since a long drive isn't all that exciting and it always feels a bit rushed, I try and limit myself to under 4 hours travel time. So that gives me a rough radius of 200 miles. This year I found lots of great places to escape to that were 200 miles or less away! (Vermont, Belleayre, etc.) Typically these are boondocking locations so setup and packing up really take no time at all. Park, pull the blinds you want closed, open a few windows and the roof vents and you're done! Simplicity and ease. More time to relax and rejuvenate. Isn't that what RVing is all about? Then there is the 4 1/2 day weekend trip. I leave Thursday late afternoon (only if I have Friday Off!) and come back Monday morning (or more likely Sunday late night, leaving for work Early AM on Monday) Since I could have a full 8 hour travel day for these trips, my range is significantly increased. I can comfortably go 400+ miles...opening up MANY interesting places to visit. Since my RV is set up to be completely self-sufficient (power, water, propane) for a minimum of 10 days, I am always ready to get on one of these trips. Sadly, I rarely get that Friday off! Since it's so rare, I like to have a few preplanned destinations and routes ready to go at a moment's notice. I really don't ever get a 2-week vacation like some folks, so extended trips are out until I can figure out a way to be on the road AND work. This will necessitate retiring from at least ONE of my jobs! It's a wonderful dream, but the companies I receive bills from still like to be paid. I can always dream....and plan! A few months ago, I found a wonderful little squeegee to use after a shower to remove the bulk of excess water from the sides of the shower stall. Works great! No more sopping wet towels! The problem was finding a place to store the oddly shaped squeegee. Originally I had it stashed in the cabinet above my Lavatory sink. Worked OK, but you couldn't reach it from the shower and you had to remember to bring it in with you to start with. I have to admit, I am "memory challenged." I may be a sufferer of C.R.S. or perhaps the advanced for C.R.A.F.T. Sad really. They say short term memory is the SECOND thing to go...I cannot remember the First! My problems aside, I began to look at empty spaces I had available to store this cool little squeegee. Shouldn't be too hard to locate a spot in the shower, right? There had to be a better way. There was, I found an elegant...well usable solution. 3M makes these semi-permanent, removable without marring the surface, hooks in a variety of sizes and colors. 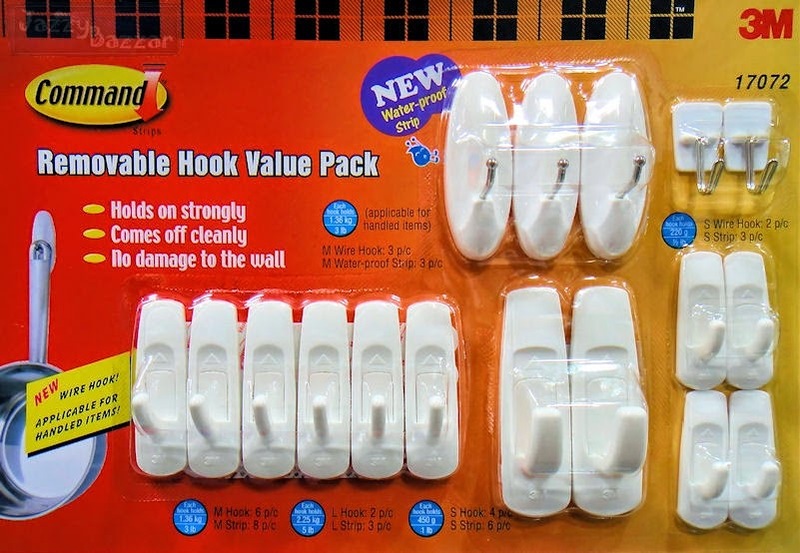 The idea is; you remove the backing paper, place the hook where you want it to stick and press it down. When you want to remove it, there is a small tab at the bottom that when pulled firmly releases the adhesive and the hooks comes off. It works on a variety of surfaces and I can attest on a fiberglass shower enclosure there was no residue when it was removed. Why did I remove one I just put on? Easy, I put it in the wrong place. Remember the adage, "measure twice, cut once?" I didn't. Since I needed two of them to hang the squeegee securely, they had to be the right distance apart. They weren't. I'm beginning to get used to false starts and re-do's! Well once I had the measurements correct and the placement wasn't in the way of a nice shower, I was happy. The squeegee lives IN the shower and doesn't use up any space I was using at all! A quick (well sort of!) and elegant solution. RV'ers,especially ones with smaller "storage challenged" rigs, will always be happy with using space that wasn't being used for anything at all! After all, it's like getting something for nothing!